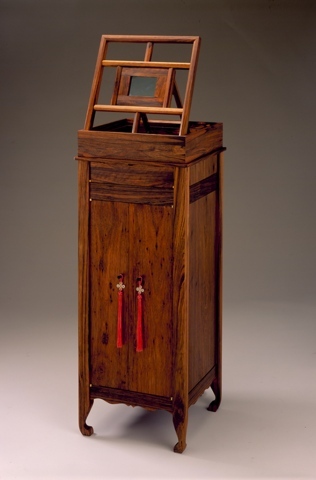 "Vanity" was created for the Inspired by China exhibition, organized by the Peabody Essex Museum and curated by Drs. Nancy Berlinger and Edward Cooke. The video was shot at Anderson Ranch Arts Center during a winter residency in 2006 and the subject of the video Karen Maruyama, an actress and writer/director from Los Angeles. The video is seen behind a two-way mirror and fades in and out - the mirror becomes a window to a woman applying her eye makeup, alternating between accentuating the slant of the eyes or attempting to make the eyes rounder.